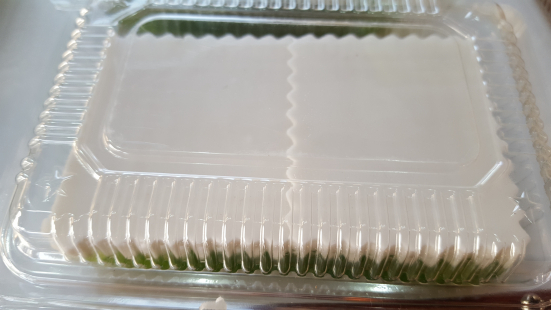 KamonVunBaiToey or coconut gelatin is made of coconut cream and milk, corn flour, geletin powder, sugar and pandan leave juice (to make it green). KamonVungBaiToey appears to be white on one side and green on the other side. The white one is where the coconut milk and cream is placed on the mold, and the green side is from pandan leave in the gelatin.